This promotion may not be used in combination with any other promotions including promotions displayed on other websites, mailers you received, or the reseller discount. When you place an order, you'll receive a free PDF proof via e-mail. This lets you verify exactly how your artwork will appear on our template. A 1/2" metal ring mechanism is available free of charge. 3/4" or 1" ring mechanisms are also available (with charge). This promotion may be used with other valid promotions (including those found on external websites). 1 1/2", 2", 2 1/2", 3"
The cover printed with 1 foil stamped area on Midnight Blue Castillian Vinyl stock. 1/2-inch metal ring. 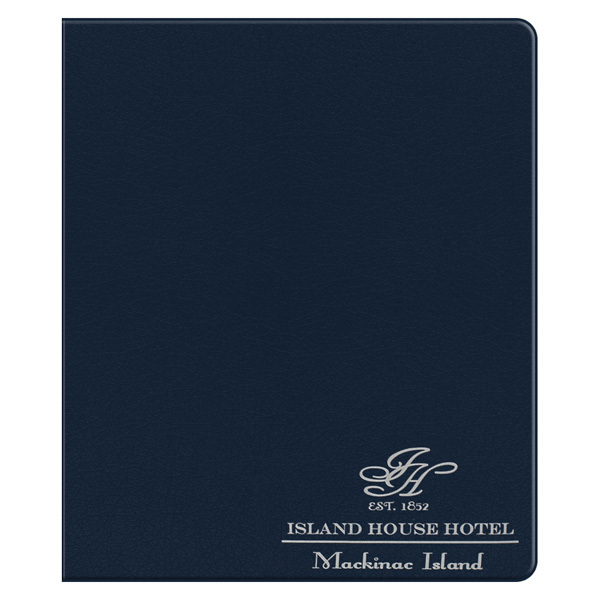 This elegantly simple binder from Island House Hotel is made from leather-like vinyl. It features the company's logo stamped in metallic bright silver foil in the lower right corner of the cover, which creates a sense of luxury and high class. The midnight blue color of the material is suggestive of mystery, professionalism and serenity. Front cover printed with 1 debossed area on Midnight Blue Castillian Vinyl stock. 1/2-inch metal rings. 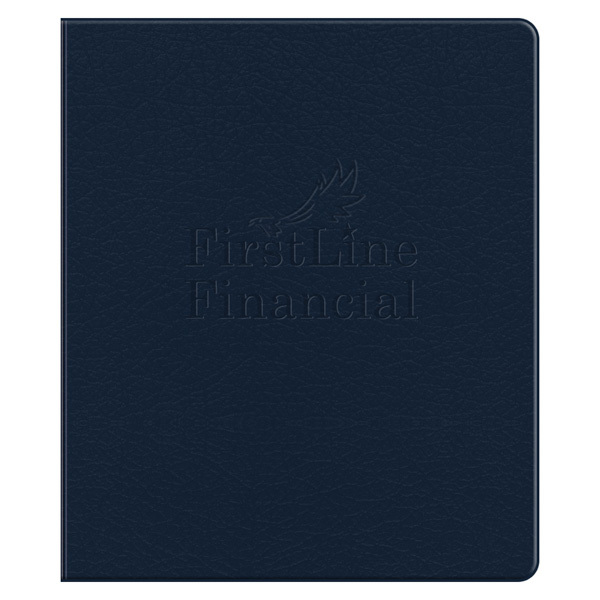 This 3-ring binder design from FirstLine Financial features the company's logo debossed on the front cover for a look that's subtle and understated, but providing an interesting textural effect. The midnight blue vinyl gives the design a serious, professional tone. Seemingly leather panels are actually made of a special vinyl material, which combines durability with the elegant look of leather. The rigid, water-resistant panels protect the contents and have a shiny, executive style surface to complement the matte interior. The exterior can be customized with corporate logos, original images, or branded elements. A metal three-ring binding mechanism makes it a snap to organize 8 1/2" x 11" materials in a format that's easy to read and use. Acceptable Insert Sizes: 8 1/2" x 11"
Please note that the delivery date depends upon many variables including artwork approval, imprint methods selected, quantity selected, and ship to location.